This exciting expedition, which includes flights, provides great diversity and will appeal to those seeking a truly comprehensive Antarctic experience. It includes visits to the South Shetland Islands, the western and northern sections of the Antarctic Peninsula, the stunning and wild Weddell Sea region located on the eastern side of the Peninsula, and the historic location of Elephant Island – a place forever connected to the epic story of Sir Ernest Shackleton and the Endurance expedition 100 years ago. Adding to the experience will be a visit to several locations in the Falkland Island archipelago –home to nesting albatross and the colourful King penguin. These diverse locations each feature their own unique attractions. Stunning glaciated scenery along the Antarctic Peninsula, enormous Adelie penguin rookeries and the flattopped ‘tabular’ icebergs in the Weddell Sea, copious history in the South Shetland’s and Elephant Island – and a whole new range of wildlife species to observe in the Falkland Islands. Throughout the voyage, our expedition ship acts as a floating wilderness lodge, which we reposition every day to yet another exciting location. You will be spoiled for choice by all of the activities we have planned. Short walks or longer hikes on shore to visit wildlife colonies, historic sites and science bases, cruising in the Zodiac boats looking for whales and seals, and spending time with the resident photography expert. The more adventurous might like to join the sea kayaking program, or perhaps spend a night camping on the ice – the choice is yours. 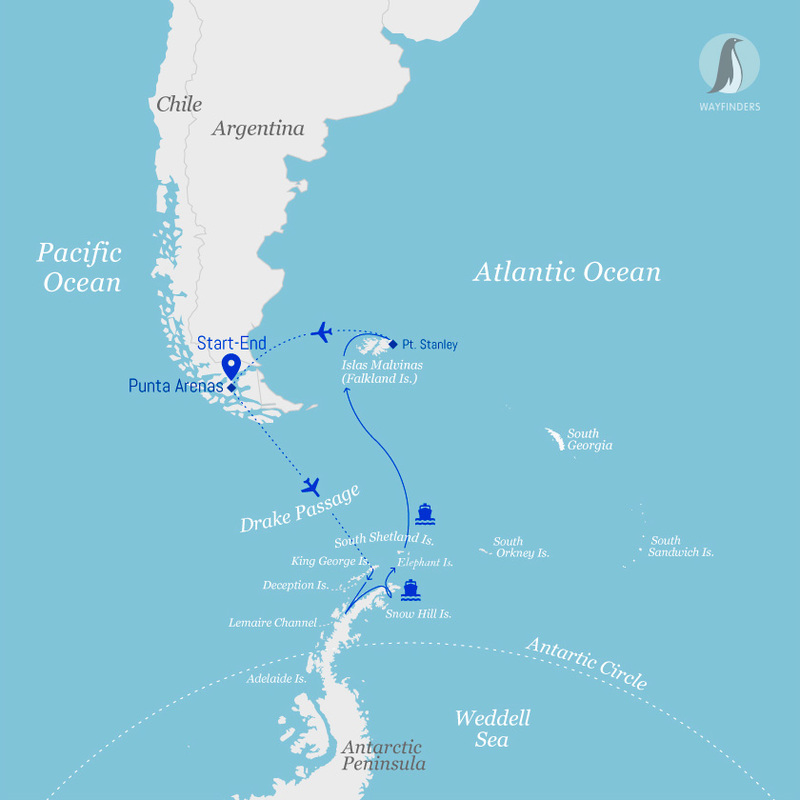 We maximize our time on this voyage by flying from South America to Antarctica, saving the two days that we would spend crossing the Drake Passage. A further day and a half is saved, by flying back to South America from the Falkland Islands at the end of the voyage. The time saved by flying to the start and end points, enables us to spend maximum time exploring the region you have come so far to experience. Over the course of 12-days, you can expect to be off the ship exploring in the company of our expert guides for nine of those twelve days. This unique itinerary has been designed for those who want the most in-depth experience possible. Overnight we have navigated across the Bransfield Strait and we awake to the towering peaks of the Antarctic continent laid out before us. For the next three days we have a varied itinerary exploring the Gerlache coastline. If ice conditions allow, we cruise through the Lemaire Channel and visit sites which may include Pleneau Island and the Penola Strait. To the south lies Petermann Island, home to a sizeable penguin rookery where both Adelie and Gentoo penguins nest side by side. A visit to an active research base nearby provides a fascinating insight into the important climate change science occurring in Antarctica. There’s a fantastic walk on a nearby island and we can make a full traverse across a snowy knoll from one side of the island to the other. The old British Antarctic Survey hut of Wordie House, begs for further investigation. Returning north, we pass the massive granite sentinels of Mount Scott and Mount Shackleton and may attempt a second transit of the Lemaire Channel. The landscape all along this section of the Antarctic coastline feature heavily glaciated mountains permanently covered in ice and snow. Our activity program is in full swing by now, and each day we enjoy guided walks on shore, visits to wildlife colonies, and Zodiac cruising among the ice with our expert guides providing insight and interpretation. Planned visits could include Paradise Harbour, Orne Harbour or Andvord Bay, or a cruise through the Errera Channel to visit the penguin rookeries at Cuverville Island. Wilhelmina Bay is another favourite location and one where we frequently encounter pods of humpback whales. We are now heading north towards Antarctic Sound – the gateway into the icy Weddell Sea. Along the way we hope to make a planned visit at Deception Island. If weather conditions permit, we sail the ship right into the middle of a volcanic caldera. This is a very dramatic place and home to several penguin rookeries along the black sand beaches. History is all around us as we explore the old whaling station, with the rusted relics and dilapidated wooden structures. Fur seals gather among the old structures seeking protection from the elements. At the far end of the beach is an old aircraft hangar. This is where Australian, Sir Hubert Wilkins made the very first flight in Antarctica in 1928. There is an outstanding hike here to a location known as ‘Neptune’s Window’ – high up onto the rim of the crater. At about 25 nautical miles long and about 10 nautical miles wide, the Antarctic Sound separates Joinville Island from the northern tip of the Antarctic Peninsula. As we sail into the sound we witness, for the first time the vastness and majesty of the Antarctic icecap becomes an awe-inspiring sight. Heading into the Weddell Sea we notice a significant increase in the number of huge tabular icebergs and the presence of sea ice. These massive icebergs break from the huge ice shelves to the south and drift north on the currents. This always makes for exciting navigation – and stunning photographic opportunities in the soft Antarctic twilight. This is wild and remote Antarctica and has a distinctly different feel from locations visited thus far. 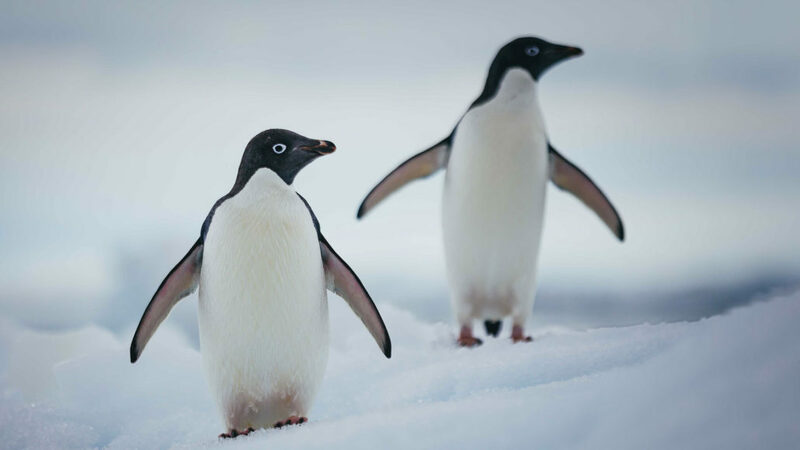 The Weddell Sea region is home to Adelie penguin rookeries of staggering size – some contain more than 100,000 nesting birds. Such colonies dwarf the rookeries we have visited so far. Weather permitting, excursions may include Hope Bay, Paulet Island and Brown Bluff. All eyes will be trained on the ice floes through which we navigate the ship. We have enjoyed successful sightings of emperor penguins in this area in recent years. Based on the size and plumage, our naturalists believe them to be juveniles out exploring and fishing – and possible residents of the known emperor colony on the southern side of Snow Hill Island. The history of exploration in this region is incredibly rich. Remnants of Nordenskjöld’s Swedish expedition of 1901-1904 are found in several locations in this area. The epic century-old story of Shackleton and the HMS Endurance expedition has strong links to the region. It was here that he and his men drifted north on the ice after their ship had been lost in the ice months earlier. As we head north and out of the Weddell Sea, the lavender pink sunset off the port quarter of the ship will make some of us pause to consider the bravery (or foolhardiness) of those early explorers who travelled these waters a hundred years before us. We approach Elephant Island from the south. Point Lookout, on the southern tip of the island, is home to an impressive chinstrap penguin colony. Macaroni penguins also breed here and are a species we have yet to encounter to date. Both southern elephant seals and Antarctic fur seals are hauled out on the beaches in large numbers. If conditions permit, we may visit the fabled location of Point Wild on the north coast of Elephant Island. It is here that Shackleton and his men were encamped under their upturned life boats, before five men set off on a rescue mission to South Georgia in their tiny lifeboat. While sailing north to the Falkland Islands our onboard polar experts will recap on our Weddell Sea adventures and prepare us for the days ahead. Much of our time is spent scanning the horizon in search of whales and other marine mammals. The spectacular seabirds including several albatross and petrel species are our constant companions as they soar above the ship. Photographing these stunning birds in flight takes great patience and skill and our resident photography expert on board will show you the best techniques. Our onboard educational program continues and our experts entertain us with interactive presentations and leading lively discussions. Arriving into the Falkland Islands overnight, we explore the islands of West Point and Saunders, both in the West Falkland archipelago. West Point is known for its rockhopper penguin rookeries and large nesting black browed albatross colony. The opportunity to observe these spectacular birds in close proximity on the nest is an immense privilege and an experience not easy forgotten. One final highlight awaits – a visit to the wildlife-rich Saunders Island. Along the white sand beaches and in the tussock grass we hope to encounter no less than four penguin species living in close quarters including gentoo, magellanic and rockhopper – and our ultimate goal during the Falkland Island visit, observing the impressive king penguin. Saunders is a fitting end to an epic Antarctic adventure. Charting a course for the port of Stanley in early evening light, we enjoy a special dinner attended by the Captain of the ship and reflect on one of life’s great travel experiences. In the early morning, we navigate through the narrows and into our port. Stanley is currently home to just over 2,000 residents and is reminiscent of a rural town in coastal England or Scotland. It is charming with brightly coloured houses, pretty flower-filled gardens, a quaint cathedral and several local pubs. There is time to explore the town, before we make our way to the airport for our return flight to Punta Arenas in southern Chile (this flight is included in the price of your voyage). It will be possible to connect to flights through to Santiago or other destinations in Chile. If you are staying in Punta Arenas, a transfer will be provided to several downtown locations.